Oropendolas (related to blackbirds and orioles) are medium-sized birds common in many parts of the Amazon region. They're sociable, noisy birds with a liquid burbling call. There are several species and their name comes from the gold (= "oro" in Spanish) color on their tails and the pendulum-like nests that are common to this group. Oropendolas are communal nesters. 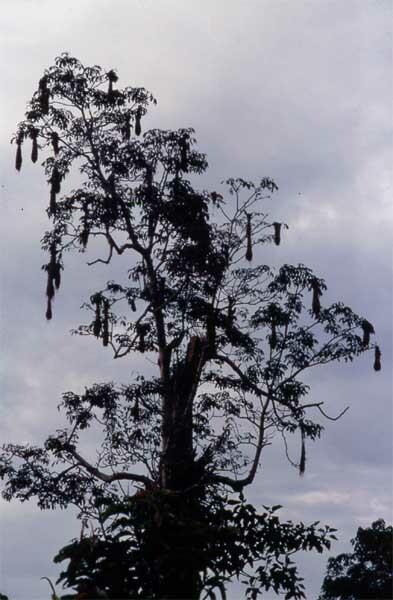 Each male builds its own hanging nest, which are grouped together in a favorite tree. The same tree may be used for many generations. Here we get a good idea of the oropendola nest construction. 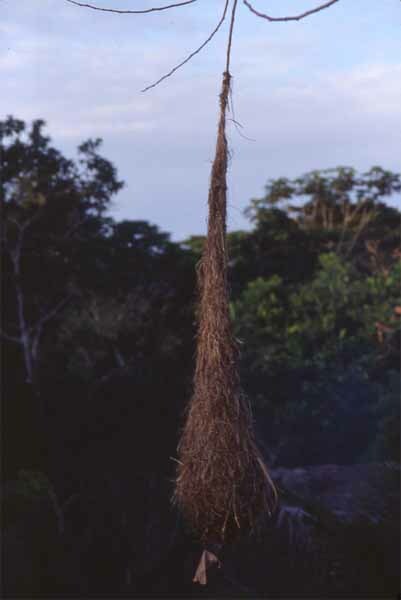 This is made by tying a strand of grass to a suitable branch and then weaving the basket-like structure. This form is believed to be an adaptation to deter predators, especially snakes. The nests can measure up to seven feet long!